Online applications are invited from eligible minority students for Pre Matric Scholarships Scheme for the academic year 2018-19. Students please apply on National Scholarship Portal. The scholarship will be awarded for studies in India in a government or private school from class I to class X, including such residential Government institutes and eligible private institutes selected. Just follow the below steps to apply for the Pre Matric Scholarships Scheme for Minorities 2018-19. Step 2 : Then Select Central Schemes tab and Click on Ministry of Minority Affairs link. Step 3 : After that click Pre Matric Scholarships Scheme for Minorities Apply link. ** As the number of scholarships for minorities available in a year is fixed and limited it is necessary to lay down preference for selection. ** Inter-se selection weightage is to be given to poverty rather than marks. ** In case of the renewal applications, such applications would be fully exhausted before the new applications are considered. ** Scholarship will not be given to more than two students from a family. ** Students should be regular in attendance for which the yardstick will be decided by the competent authority of the school. ** Income certificate from the employer for employed parents/guardian or Certificate to be issued by the Competent Authority declared by the State Government/ UT Administration. ** Migration of student from one school/institute to another would not normally be during the course of academic year except under exceptional circumstances and in the interest of student’s academic career. ** The school/institute will certify the claim of student of being an outstation student not residing in hostel of the school/institute concerned. ** Course fee/Tuition fee and Maintenance allowance will be credited to the school’s/institute’s bank account. ** The student obtaining benefits under this scheme shall not be allowed to avail of benefits under any other scheme for this purpose. ** The fund for distribution of scholarship in subsequent year will be released after receiving the utilization certificate for the previous year. 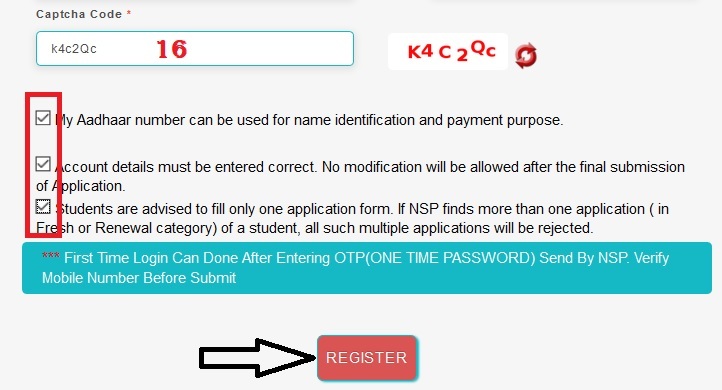 Our school has already registered on NSP Portal but when login, OTP password has not reached through SMS. I already registered for new account login, account created successfully, but OTP password not yet reached Through SMS, can you please clarify these issues, how I can open the successful account without password even email ID also registered, why they cannot send through email also, please clarify the these issue. From where can I download the sanctioned list of selected students of Prematric Scholarship 2017-18. I AM STUDYING IN ROYAL PRIMARY SCHOOL. I WANT TO ADD MY SCHOOL IN NATIONAL SCHOLARSHIP PORTAL. PLEASE GUIDE ME. Please tell me, How I can correct the name of School/Institution in NSP? Correct Name is MOHAMMED ALI HIGH SCHOOL (UDISE CODE:18080306005). But wrongly registered in NSP as MOHAMMED ALI M.E.S. I REQUEST YOU THAT, STUDENTS WHO ARE STUDYING IN A SCHOOL CONTAINS CLASS 1ST TO 10TH, NEED THE INCOME CERTIFICATE FROM COMPETENT AUTHORITIES FOR SCHOLARSHIP, BUT SOME PARENTS ARE NOT ABLE TO PAY THE EXPENDITURE OF INCOME AS WELL AS ONLINE SUBMISSION SO, PLEASE GIVE PERMISSION TO TAKE DECLARATION IN WHITE PAPER. I NEED THE STUDENT, FAMILY AND INSTITUTE VERIFICATION FORM FOR YEAR 2018-19. WHERE WILL I GET IT?